Many good sayings are to be found in holy books, but merely reading them will not make one religious. 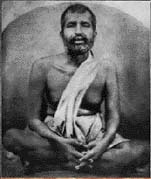 One must practice the virtues taught in such books in order to acquire love of God. As a wet-nurse in a wealthy family brings up her master�s child, loving it as if it were her own, yet knowing well that she has no claim upon it, so you also think that you are but trustee and guardians of your children whose real father is the Lord himself. Because of the screen of Maya (illusion) that shuts off God from human view, one cannot see Him playing in one�s heart. After installing the Deity on the lotus of your heart, you must keep the lamp of remembering God ever burning. While engaged in the affairs of the world, you should constantly turn your gaze inwards and see whether the lamp is burning or not. As long as you are a person with an ego of your own, cannot conceive, think of or perceive God other than as a person. Good and evil cannot bind him who has realized the oneness of Nature and his own self with Brahman.